SALISBURY, Md. 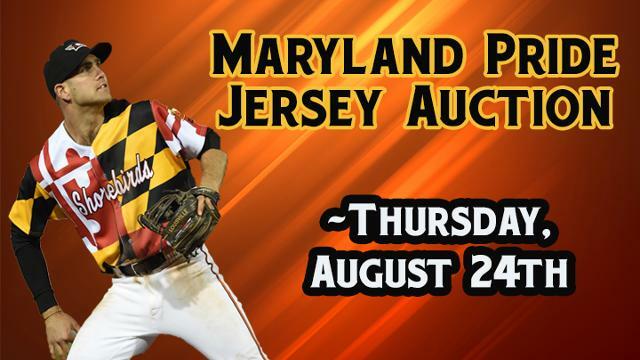 -- The Delmarva Shorebirds, Class-A affiliate of the Baltimore Orioles, will be auctioning off the Maryland Pride Jerseys that the team has worn every Thursday home game during the 2017 season on Thursday, August 24th during their game against the Hickory Crawdads. The Shorebirds started embracing fans' love for the Maryland State Flag this year by implementing Maryland Pride Thursday for every Thursday home game by wearing jerseys that model the Maryland State Flag. All proceeds will go to the Shorebirds' Fly Together Fund. The Fly Together Fund is used to help fund local community projects, with a focus on youth centers and youth sports. First pitch is scheduled for 7:05 PM on Thursday, August 24th with gates set to open at 6:00 PM.